What about market Breadth ? 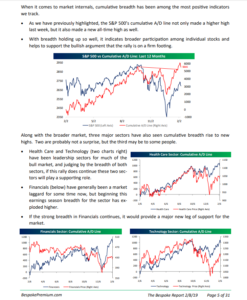 The attached commentary on breadth was from the Bespoke Report, dated February 8th, 2019. As regular readers know, this blog is a big fan of Bespoke Research. For the cost, the site is one of the most insightful commentaries available on the Street, both from a market scope and depth perspective. Most pundits would agree that “market breadth” has held up particularly well during this correction, far better than prior to the 2000 and 2007 bear markets. Summary / conclusion: Readers should never focus on just one indicator or metric: SP 500 earnings, technical analysis, volume, breadth all count in evaluating market risk, but instead investors should look at the bigger picture including credit spreads and valuations to arrive at the best market opinion. High yield and corporate bond spreads have actually rallied more in percentage terms since the December 24th and 26th bottom for the SP 500, and both the SP 500 and credit spreads have stalled as the SP 500 reached the 200-day moving average this week. My own opinion is that this current correction is just that – a temporary correction – in a secular bull market, and that the SP 500 makes new all-time-highs in 2019. The first key level to be overtaken is the 200-day moving-average and then the SP 500 should make a run at the Sept ’18 highs near 2,940 – 2,941. Take all opinions and predictions with a substantial amount of skepticism. What are the fundamental foundations supporting this statement, taking into consideration the global macroeconomic outlook, not just the US economy?